When Pop was cleaning out his desk at work, he found some mighty inneresting things and brought home the stuff that wasn't crawling. Some of the stuff even has dust and dirt and possibly human remains from 9/11. *Bows head* He even brought me some souvenirs. One of the souvenirs was a little kitty-size basketball. It's a wonderful little ball that has the same feel as a real basketball! Just in time for the NCAA finals. I'm sure everybuddy knows that I picked last year's winner in the March Madness brackets. I sure bragged about it to anyone who'd listen. This year, due to circumstance, I didn't pick brackets. I guess TW was afraid I'd make some money if I won. For those who don't know—and probably don't care, MOL—the Final Four takes place today night in Atlanta. Louisville vs. Wichita State and Michigan vs. Syracuse. CK with the ball. She dribbles upcourt looking to make her break. The Toms are double-teaming her. Point five seconds left on the clock. She fakes left, goes right and puts it up from beyond the arc. Nothing but net! The Alleys—helped by CK's career high 47 points—win! CK's trey at the buzzer beats the Toms and sends the Alleys into the Final Four for the first time. Tuna Kat gives her the game ball as the celebration begins! Back to reality. What do you mean by that, Woman? I could have won that game. I'm very athletic! It was even mentioned in my Petfinder.com profile! Some of our furrends are involved in brackets of their own over at AmazeCats. I still don't know why I wasn't invited to the dance but that's neither here nor there. I am a Top Shelf Cat whether they say so or not. They dissed me plain and simple. Sparkle already advanced to the Elite Eight, voting for Cody ends 2 pm today and next week you can vote for Allie and da Boyz and my BFF Katie. Stay tuned to their blogs cos I'm sure they'll give you all the details you'll need to know to vote. I can tell you that you'll need a Facebook account to vote on their FB page. If your peeps have one, make sure they vote also. I am sure you dribble with the best of them...erm. The current bracket is a real nail-biter! I am trying to figure out how to get votes out to keep Cody in second place! 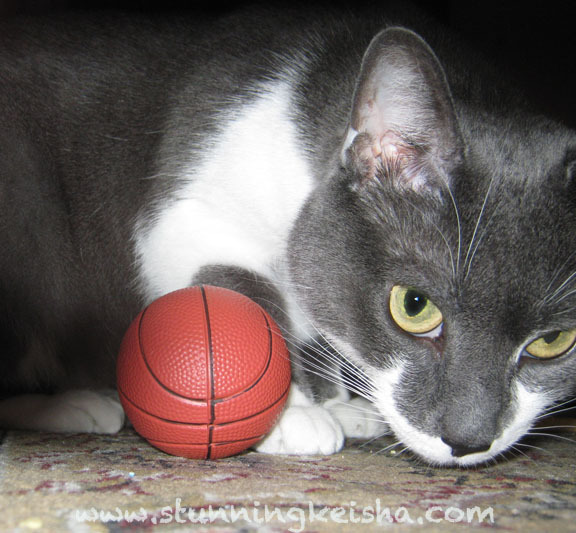 We agree Keisha , we bet you are a purrfect dribbler. Have a super Saturday. You always have a ball CK and I agree, you are totally top shelf! I think you could just take that ball and run with the best of them, CK! We are going to watch the Final Four! Mommy says that we have to cheer for Wichita State cause her and daddy graduated from there and hu sis is going to school there! So....Go Shox! Have a great weekend! I'm not going to watch the Final Four ! We'd probably be much bigger basketball fans if we could watch you, CK! I'm liking the idea of a net. I bet a cat, for example an orange teenager, could get all wrapped up in a net. Thanks for the shout-out, CK! I certainly don't know why you're not in the running. It 's a blatant flaw in the system. CK, we'd much rather watch you play with that ball than those final four teams...thought the dad says we gotta watch the Michigan game...though with the mom being a Michigan State grad, she's not too inclined to watch. We were disappointed Cody didn't make it to the next bracket today. aha!! I always knew you were a jock!! Right on!! Paw pumps!! We are waiting with our breath held for the final four for NCAA women's basketball...Mom's Lady Bears, CAL, made it to the final four for first time in CAL history. They are scrappy, probably won't make it to the final, but they got this far!! GO BEARS!!! CK - Pawrents sometimes just don'ts gets it! We lost interest after Marquette lost. Sigh. Mowzers, CK! You got them moves down fur sure! Thanks for the bracket mention - we's kinda excited about all the fuss - if it brings us treats! They did mention treats, they DIDN'T?!?! What kinda (b)racket is this anywayz? what a girl - what a SCORE!!!! Reality is highly over-rated. Stick with your fantasy--it's much more fun! You rock CK! No go post BOL! We know you're a Yankee fan, but how about, for just a little bit supporting a Michigan team? GO BLUE, dear friend. Sorry, we're behind here and just now getting to this post. M loves that little basketball - it's just purrfect for a kitty. The Night My Life Flashed Before My Eyes!